MUMBAI, INDIA: Come July 29, Microsoft will make Windows 10 available across 190 countries as a free upgrade to computers running Windows 7 or Windows 8.1. You have one year (until July 29, 2016) to take advantage of this offer. But if you are still stuck with an old Windows Vista or a previous version, you will have to pay $119 for Windows 10 Home or $199 for Windows 10 Pro. 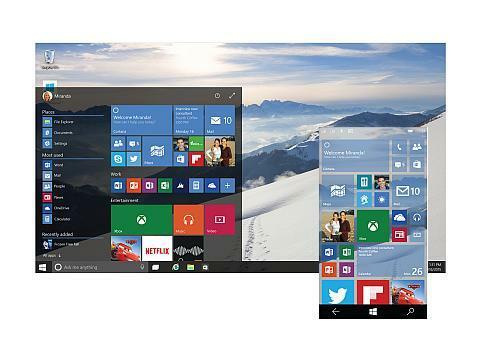 I am wondering whether it is worth upgrading to Windows 10, and laying bare my thoughts here. “It’s the Windows you know, only better” reads the tagline on Microsoft Windows 10 homepage. Following are the reasons I am enticed to download Windows 10 OS, in no particular order. Faster performance: If you are upgrading from Windows 7, the first thing you will notice is the significantly faster boot up. Also it is quicker to go in and out of standby. Physical memory reserved by processes is also less compared to Windows 7. For those upgrading from Windows 8, you won’t notice such sizeable gains in performance but will find the new operating system snappier in general use. Return of the Start Menu: How I missed the feature in Windows 8! Yes, my beloved Start Menu is being reintroduced. A click on the Start button will bring up two panels side by side, showing the most used, recently installed and pinned apps on the left (familiar to Windows 7 users) and Start Screen Live Tiles on the right (familiar to Windows 8 users). Universal search: You will once again find the search tool integrated right into the Start Menu. Just input the search term, and it will show you combined search results, which includes a list of applications, folders, and documents matching the term along with results from the Web. Personal digital assistant: In the era of hands free interaction with technology, Windows 10 comes with Cortana—an intelligent personal assistant originally introduced in Windows Phone 8.1. Cortana can be used to search your PC for files and apps, as well as for Web searches. Being a personal assistant Cortana can monitor your calendar to provide alerts for scheduled meetings. Also upon integration with Microsoft’s Power-BI it can provide business intelligence. Universal apps: Windows 10 lets you find software you need through Windows Store similar to Windows 8, but the difference being that now you can run apps either windowed (desktop-friendly) or full-screen (touchscreen or tablet-friendly). These Universal apps have user interfaces that adapt according to the screen layout as well as user controls for instance user interaction via touch or mouse. One of the primary reasons behind Windows 10 being a free upgrade and the introduction of universal apps that will operate on a common core that works across all platforms (from PCs and tablets to Windows Phones, Xbox and the Internet of things) is to entice developers like us. Microsoft offering Windows 10 for free equates to more people upgrading, hence developers will be able to work much faster and create better applications, leading to a healthier Windows Store and increased revenue through apps sales. Action center: Similar to the application available on mobile phones, Action center is a central notifications area that shows messages from email, the system (Windows updates), and from apps, for instance a birthday reminder. Also you will be able to access missed notifications unlike in Windows 8. It is also a clear advancement over Windows 7’s system tray notifications. Better Web browsing experience: Windows 10 features Microsoft Edge as the default Web browser, which uses an all new rendering engine to considerably improve the speed and compatibility, making its performance comparable to other modern browsers such as Chrome and Safari. Also inclusive are some new capabilities such as webpage mark-up and reading mode that increases the legibility by focusing on just the text content. Increased security: Windows 10 Pro version includes Secure Boot which only allows apps signed by Microsoft or hardware manufacturer to run during boot-up. Apart from secure app management, Windows 10 Pro also provides device management via Device Guard along with Microsoft Passport and Windows Hello. Virtual desktop: The introduction of virtual desktops, similar to workspaces in Linux or Mac, allowing better Windows management and task switching for the limited available screen real estate is certainly a major lure to upgrade to Windows 10. Gaming: A unified XBOX app that not only does the usual, like keeping track of your gaming stats, achievements, allowing you to chat with friends, view their XBOX activity feed, recording gameplay, but also offers interesting new ability of Cross-Device gaming (Cross-Device Multiplayer-multiplayer gaming between XBOX One and Windows 10 devices !) With exclusive access to DirectX 12, programers get better access to graphics hardware allowing them to optimize their games to improve overall performance. 1. If you have an old computer running Windows Vista or Windows XP, your computer won’t qualify for the free upgrade offer. Also your computer might not meet the specifications or system requirements. In that case (especially if you are running Windows XP), I would recommend you upgrade the system since Microsoft stopped supporting Windows XP since April 8, 2014. 2. If you prefer the current system and none of the above mentioned features seem encouraging enough, you can stay on Windows 7 (Microsoft will provide extended support till January 14, 2020) or Windows 8.1 (Microsoft will provide mainstream support till January 9, 2018 and extended support till January 10, 2023). 3. Windows 10 will lose some features like Windows Media Center and Windows Desktop Gadgets (from Windows 7), although there are many third party alternatives to them. Whether you upgrade from Windows 7 or Windows 8.1, there are some good reasons to move to the latest offering from Microsoft. The considerable gains in performance that will be most noticeable to Windows 7 users, the reintroduction of Start Menu which the Windows 8 users were waiting for, and a host of solid new features make a compelling case for upgrading.